Thank you, one and all, for your great comments! I loved reading them! Unfortunately, just one was chosen by random.org. 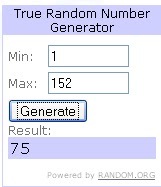 It was #75! If I could put $25 in each of your paypal accounts, I would definitely do so, but I just don't have an extra $3,800. Do keep coming back, as I'm known to host these little events every so often! It's my way of saying thanks and have a great day! It's time for me to give away $25 to someone's PayPal! Don't know what PayPal is? It's easy to set it up. You get paid through your e-mail! Google it and set it up! It's easy! And for me, being paid to my PayPal is better than a gift card because I can choose where to spend it! It's true, Money is like an arm or leg - use it or lose it! I'd love to get a few comments on some of my poor, neglected posts! So I'm giving you a choice of entries today! Pick one of the blog posts under my tabs above: (fashion, health & beauty, life in general or noteworthy news), make a comment there, and come back and tell me here that you did! That's it! If you want extra entries, make a few comments on different posts and come back and let me know! Commenting is unlimited and counts as one entry each, as long as they are constructive and you let me know on this post which ones you commented on! Sound good? Great! I will select a winner on July 12th at 11:59 MST! The winner will be notified by e-mail and given 48 hours to respond. I will then deposit your $25 into your PayPal! Happy commenting! NOTE: Some of your comments may end up in my comment moderation section and may not show up immediately. Don't worry, if that happens I will retrieve them and make sure they get published! A Hook-up To A New Summer Trend--Crochet! I commented on A Few New Hair Ideas. Hope you get lots of comments! Hi! I left a comment on your longboarding post! I commented on the fashion trends of 2011 post! I commented on "My Dabble Into Long Boarding! ", thanks for the chance! Also commented on "Famous Last Words!" Commented on the A Hook-up To A New Summer Trend--Crochet! Commented on the Just a Couple of Ideas from GOOP! Commented on 'Some New Hair Ideas'! Commented on 'Keep Your Health While Blogging'! Commeted on 'Foods That Heal'! posted a comment in The Skill of Knowing How To Tick People Off! Commented on 'The Day The World Stopped'. I commented on your 'Foods that Heal' post. I commented on your 'The Day the World Stopped' post. Commented on ' To read more books'! I commented on the SANITY VS. VANITY post! I commented on Some New Hair Ideas! Some are totally insane but yet fabulous. I love it! I commented on A Hook-up To A New Summer Trend--Crochet. I have commented on Foods That Heal! Commented on 'A New Way To Monitor Tailgaters'! Commented on 'This Is For Real!'! I commented on the disc golf post! Commented on 'A Man With A 'Stache'! Commented on the disc golf post! To Find Uses For Common Items! Commented on the cooking class adventure! Commented on A Fun Halloween Ride! I commented on : A Man With A 'Stache . I commented on Was This 3rd Grade Teacher Going Overboard? Commented on The Skill of Knowing How To Tick People Off! I commented on Keep Your Health While Blogging! Thanks for the great smile maker post! I posted on your longboard adventure. Thanks!! I commented on your Wimbledon post. I'm excited about your giveaway here! So, I went and commented on a few of your posts just now. The first one was "A Hook-up To A New Summer Trend--Crochet!". Also commented on "Just a Couple of Ideas from GOOP!" 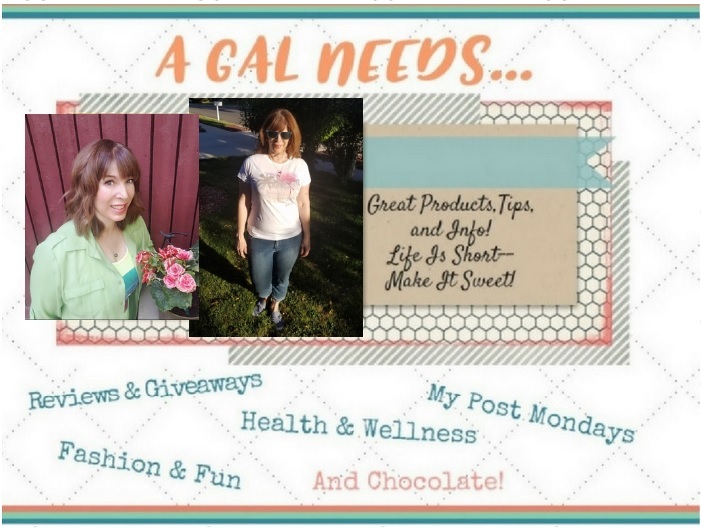 Also commented on "Keep Your Health While Blogging!" Also commented on "Foods That Heal!" So nice to meet you. I would have been stopping by if I'd known about your blog. The pressure is on now... LOL! I commented on your 'Foods that Heal' post. Very informative and well written, as well as a very important list to remember. I commented on your post about crocheted clothing. I commented on 'The Day the World Stopped'. I commented on Some Great and Not-So-Great Car Decorations. Thanks for the laugh-I think those things are hilarious! I commented on "sanity vs. vanity"
i commented on "foods that heal" post. I commented on "keep your health while blogging"
commented on "a new way to monitor tailgaters" post. Left a comment on your SANITY VS. VANITY Post. I commented on your A Cooking Class Adventure Post. Commented on the Same Recipe, Different Outcomes Post. Left a comment on the Dividing The Family Pie Post. I commented on your A Hook-up To A New Summer Trend--Crochet! Post. Commented on your Keep Your Health While Blogging! Post. Left a comment on your A Fun Hobby Post. Commented on My Friend Had Babies - 8 of Them! Commented on Gina Parker PR - NOT! I commented on Finds from GOOP! I commented on some new hair Ideas. I left a comment at A Hook-up To A New Summer Trend--Crochet! I commented on a Fun Hobby! I commented on Foods That Heal. Thanks for the giveaway! I left a comment on the A Hook-up To A New Summer Trend--Crochet! post. Cute dress! I left a comment on the SANITY VS. VANITY post. It says the comment is awaiting moderation though..
Left a message on your Summer Trend - Crochet post. Commented on Is this Really the Life Cycle of a Man? Commented on This Is What People Do For Fun In Winter Here! Commented on A Great Place To Run and Walk! I posted on Was This 3rd Grade Teacher Going Overboard? Obviously some of the "moms" that posted on that thread have not been in a 3rd grade public school classroom for a long time, if ever!